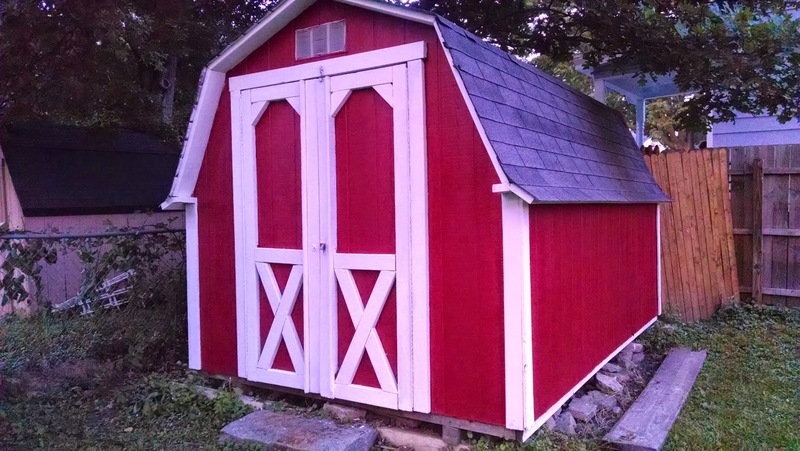 It definitely saved me a bunch of time to have 3 people all working together instead of just me by myself, but their skill sets were not awesome (then again, we're talking about painting a shed--how good does it need to look by the end of the day?) but it certainly got the job done. I needed to touch things up today to get a real finished look to it all but all said and done, it was a $40 well spent. Thank you homeless peeps! One thing Mike mentioned while we were out back painting was that there is a general lack of trust nowadays compared to how it used to be. You used to be able to go door to door looking for work and people would give you odd jobs to make a quick buck. These days there is a skepticism towards letting people into your yard or house, even if they are genuinely trying to make some honest money by helping you out. It was then that I realized we have lost our sense of how a community should function. Instead of letting some desperate person come by and give you a hand for a hand out, you want security and a quality guarantee, so you hire the job out to a company. If I want my shed to look great, I will hire a painting company. If you need some furniture moved, you call a company and have the professionals move it (with their little blue footies and all), if you need some council for a tough situation you seek the advice of a psychiatrist or professional councilor instead of seeking advice from a close friend, and if you need close friends you join a chat room instead of getting plugged in at your local church. Community was designed for each of us to bring a gifting to the others so that everyone can benefit from each person's unique skill set. If I am a musician, it would be my contribution to the community to give piano lessons to the neighborhood children, while someone else cuts the grass or helps field-dress a cow (sure, it could happen). You put out a plea to your small group when it's time to move instead of hiring professional movers. You seek accountability from a friend before spending money on a psychiatrist. We have created a buyable community. If that community doesn't in your life, no worries, you can pay someone to do it. Why inconvenience your friends when you could pay professionals to be your friends? If I wanted to start a really successful business tomorrow I think I would just think of sometime when I needed friends and asked them to help me and I would solicit that help to the city as hired out work. And I bet I would make good money doing it too. Church, it's time to build community again. If you see someone in your community who needs help, don't wait for them to ask for it, volunteer your assistance first. See the need and fix it. Offer to help others move. Make yourself available for conversations. Bring meals when someone is sick. Cut your neighbor's grass while they are on vacation. Let's function as buildable community instead of buyable community.